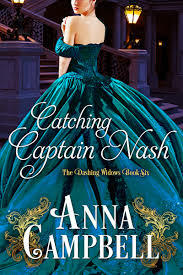 The Dashing Widow Series is one of the best in the Historical Romance Genre and Anna Campbell is an exceptional story teller. Even though this series is written as novellas, they read like a full length novel. This story begins with a husband thought dead arriving home to find his brother Silas announcing the engagement of his wife to another man. Captain Robert Nash was lost at sea and picked up by pirates and was kept prisoner for five years. He was cut off from all human contact and tortured daily. The only thing that kept him sane were thoughts of his wife and dreaming of seeing her again. Morwenna Nash has mourned her husband for five years and is finally persuaded by his family to move on with her life. She knows that she will never love another man like she loved her husband Robert. What no one counted on was her husband appearing at her betrothal ball to another man. Robert is not the same confident, witty gentlemen he was when they married, and she is not the same naive young woman. Can they find the way back to the love that brought them together five years ago? This is a beautiful love story that runs a plethora of emotions that will take them on a journey of revelations that brings sorrow or a love to last a lifetime. I would read an ingredient label if Anna Campbell wrote it. She is that good. This book is worth so much more than the 99 cents price tag. I recommend Anna's book whole heartily.